Eternity Air captures all the different shades of sky and the purest oxygen in the Sky of The Sky accord and ties it to the essence of everlasting love. 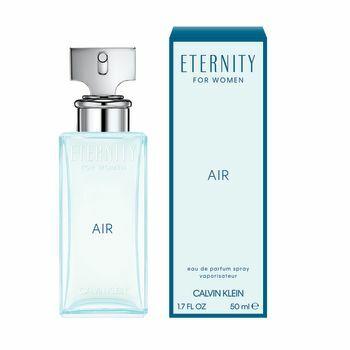 Eternity Air for Women opens with the freshness of the sky of the sky accord, illuminated by a sparkling grapefruit and black currant. At its heart, floral notes of muguetand peony envelop a pear accord, while cedarwood, ambergris and skin musk linger with warmth and sensuality. Radiant. Sparkling. Bright.